Dr. Fadi M Shamsham, MD is a Doctor primarily located in Mount Vernon, IL. He has 26 years of experience. His specialties include Cardiovascular Disease, Internal Medicine and Cardiology. He speaks English. Dr. Shamsham has received 2 awards. The overall average patient rating of Dr. Fadi M Shamsham is Great. Dr. Fadi M Shamsham has been rated by 13 patients. From those 13 patients 4 of those left a comment along with their rating. The overall rating for Dr. Fadi M Shamsham is 3.9 of 5.0 stars. Dr Shamsham did an procedure yesterday morning looking for blockages around my heart. Dr Shamsham found the blockage and put in a stent. Today I walked the dog to the postbox and back home via the lakefront climbed the hill with NO tightness or breathlessness. I am very gratefull to Dr Shamsham for what is for me a momementous occasion. This is one very happy old Sailor. Very Glad to have him in our town. Exceptional service. Very professional, but also very nice. Accurate diagnosis and treatment. He had an obsession with a cardiac birth defect that I haven't had problems with in years. Despite telling him repeatedly that wasn't my chief complaint, he still obsessed about it. Then he did a transradial cardiac cath with inadequate anesthesia and the pain during the procedure was excruciating. I will never return to his office again. This doctor is totally focused on your office visit or procedure. He is very professional while showing a very caring and concerned side. Other doctors have stated their respect for him and his medical knowledge and accuracy. I would highly recommend Dr. Shamsham. One negative is his receptionist comes across initially as distant, although efficient. Practice includes: Nuclear stress testing, transesophageal echocardiography, coronary angioplasty/ stent placement, peripheral vascular interventions, pacemaker, AICD, CRT-D implantation. Take a minute to learn about Dr. Fadi M Shamsham, MD - Cardiology in Mount Vernon, IL, in this video. Dr. Fadi M Shamsham is similar to the following 4 Doctors near Mount Vernon, IL. 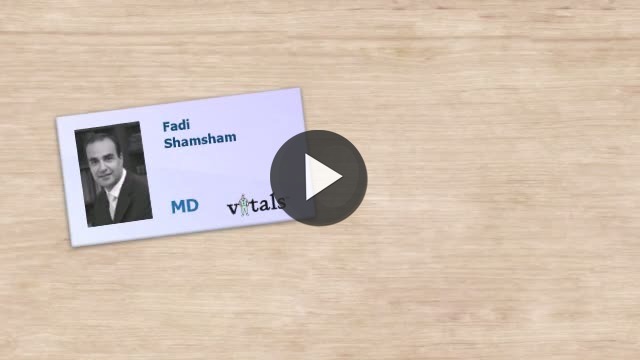 Have you had a recent visit with Dr. Fadi M Shamsham? Select a star to let us know how it was.